SIVT fraud detection: What are falsified viewable impression decisions? “Falsified viewable impression decisions” is one example of SIVT. What are “falsified viewable impression decisions” in the MRC definition of SIVT? According to the MRC, falsified viewable impression decisions are considered SIVT. 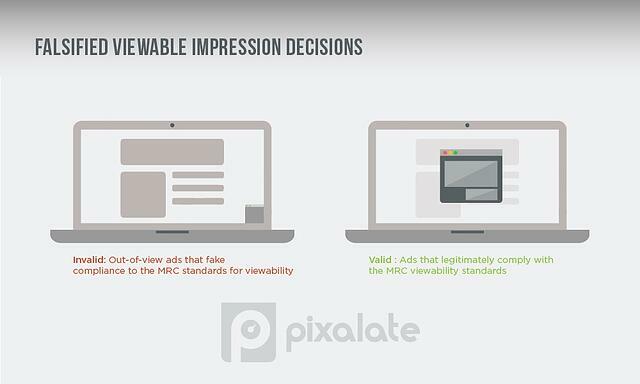 Simply put, out-of-view ads that fake compliance to the MRC standards for viewability are considered falsified viewable impressions. An ad is considered viewable if at least 50% of its pixels are in-view for at least one continuous second. Ads that are measured as viewable are commonly worth more to advertisers, and are therefore commonly sought out. MRC-accredited ad fraud detection and prevention companies must be able to identify falsified viewable impression decisions. GIVT fraud detection: What is activity-based filtration?